You can manually re-index or delete single files or folders within Local/Network Files or Web Pages sources. This process is useful when only a few documents have to be re-indexed and the refreshing or rebuilding process takes more time than manual modifications. In the Sources and Collections page, in the Sources section, expand the drop-down list of the source that you want to modify, and then select Refresh Documents. In the Address box, enter the path of the file or folder. In the Options section, select either Refresh/Add to index or Remove from index and select the appropriate check boxes. For more information, refer to the following table. Re-indexes documents only if they have been modified since the previous indexing date. Indexes or deletes subfolders or subsites recursively. Example: If \\CoveoServer\Help\AdminTool\ is the main address and the Index subfolders check box is selected, then \\CoveoServer\Help\AdminTool\Sources\ and \\CoveoServer\Help\AdminTool\Sources\Local\ are also re-indexed or deleted. Writes the transaction in the index at the end of the re-indexing or deleting process (see What Is a Transaction?). 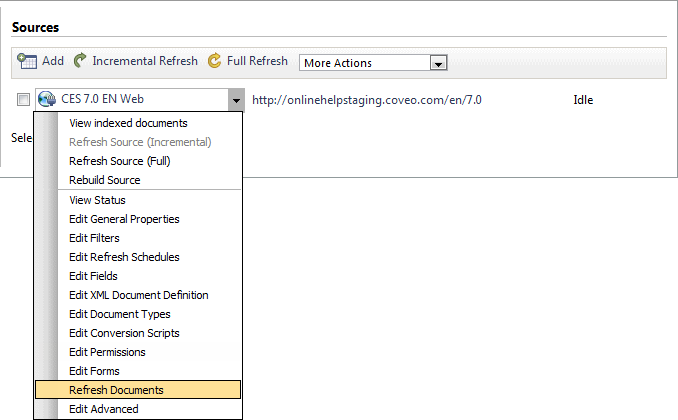 Adds exclusion filters to keep Coveo Enterprise Search (CES) from re-indexing deleted documents during the next rebuilding or refreshing process (see Adding or Modifying Source Filters).